mPort-S is end of life (EOL) with no replacement. 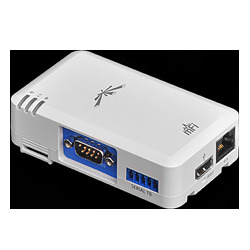 The mPort Serial features RS232 serial connectivity through a standard DB9 serial port. Once a machine is connected through the serial interface, the mPort Serial can attach to the IP network using built-in WiFi or Ethernet. From there, a terminal screen can be launched through the mFi controller software to control the connected machine. The mPort Serial also features an external antenna connector to support longer range industrial applications.